US Defense Secretary Jim Mattis said Thursday, April 26, that French special operations forces arrived in Syria over the past two weeks to help boost US-led efforts against the Islamic State group. “You’ll see increased operations on the Iraqi side of the border, and the French just reinforced us in Syria with special forces here in the last two weeks. This is an ongoing fight right now.” On social media, there are rumors on the possible presence of French troops at Deir Ezzor. Soldiers from Paris have arrived in the Syrian province, together with elements of the SDF. Their base could probably be near the village of Kamal Atallah, [Hatlah Tahtani?] north east of the city of Deir Ez-Zor, about a hundred elements, equipped with armored vehicles, rocket launchers and mobile radar (Orient News). According to State Department coalition envoy Brett McGurk, fighting against Islamic State in Syria is ongoing in two areas close to the Iraqi border, one east of Shaddadi and the other in the far southeast at Bukamal. The latter has been the site of most recent U.S. airstrikes in Syria. On April 1 in Syria, Coalition military forces conducted one strike consisting of three engagements against Daesh targets. Near Abu Kamal, one strike engaged a Daesh tactical unit and destroyed a Daesh vehicle. On March 31 in Syria, Coalition military forces conducted one strike consisting of one engagement against Daesh targets. Near Abu Kamal, one strike engaged a Daesh tactical unit. British army Maj. Gen. Felix Gedney, deputy commander for strategy and support at Combined Joint Task Force Operation Inherent Resolve. In Syria, the coalition is disturbed by ISIS forces operating in areas controlled by the Assad regime with impunity, Gedney said. The Russian military is also operating in the area, and that complicates counter-ISIS operations in the Middle Euphrates River Valley. Trump and Putin had agreed on the sidelines of the Asia-Pacific Economic Cooperation (APEC) summit that a political solution was needed on Syria. The Presidents agreed to maintain open military channels of communication between military professionals to help ensure the safety of both U.S. and Russian forces and de-confliction of partnered forces engaged in the fight against ISIS. They confirmed these efforts will be continued until the final defeat of ISIS is achieved. The Presidents agreed that there is no military solution to the conflict in Syria. They confirmed that the ultimate political solution to the conflict must be forged through the Geneva process pursuant to UNSCR 2254. They also took note of President Asad’s recent commitment to the Geneva process and constitutional reform and elections as called for under UNSCR 2254. The two Presidents affirmed that these steps must include full implementation of UNSCR 2254, including constitutional reform and free and fair elections under UN supervision, held to the highest international standards of transparency, with all Syrians, including members of the diaspora, eligible to participate. The Presidents affirmed their commitment to Syria’s sovereignty, unity, independence, territorial integrity, and non-sectarian character, as defined in UNSCR 2254, and urged all Syrian parties to participate actively in the Geneva political process and to support efforts to ensure its success. Finally President Trump and President Putin confirmed the importance of de-escalation areas as an interim step to reduce violence in Syria, enforce ceasefire agreements, facilitate unhindered humanitarian access, and set the conditions for the ultimate political solution to the conflict. They reviewed progress on the ceasefire in southwest Syria that was finalized the last time the two Presidents met in Hamburg, Germany on July 7, 2017. The two presidents, today, welcomed the Memorandum of Principles concluded in Amman, Jordan, on November 8, 2017, between the Hashemite Kingdom of Jordan, the Russian Federation, and the United States of America. This Memorandum reinforces the success of the ceasefire initiative, to include the reduction, and ultimate elimination, of foreign forces and foreign fighters from the area to ensure a more sustainable peace. Monitoring this ceasefire arrangement will continue to take place through the Amman Monitoring Center, with participation by expert teams from the Hashemite Kingdom of Jordan, the Russian Federation, and the United States. In addition, President Trump noted that he had a good meeting with President Putin. He further noted that the successful implementation of the agreements announced today will save thousands of lives‎. Rising tensions between U.S.-backed Syrian forces and the Russian-backed Syrian army — both of which are battling IS — race for control of oil and gas-rich areas of eastern Syria is engendering Russian military accusations. The claim is that the U.S, is turning a blind eye and effectively providing cover to the Islamic State group’s operations in an area in eastern Syria that is under U.S. control. The Russian Defense Ministry spokesman, Maj. Gen. Igor Konashenkov, said on October 6 that IS militants have used the area around the town of Tanf near Syria’s border with Jordan — where U.S. military instructors are also stationed — to launch attacks against the Syrian army. He says the area has become a “black hole,” posing a threat to Syrian army’s offensive against the IS in eastern Der el-Zour province. The Shaheed-129 drone was armed and displayed hostile intent when it was intercepted by an F-15E Strike Eagle around 12:30 a.m. local time near the Syrian city of Tanf, according to U.S. Central Command. It was observed heading toward coalition forces, who were outside the outpost, officials said. Squadrons of F-15E Strike Eagles are routinely deployed to al Udeid Base in Qatar. The U.S.-backed New Syrian Army said it was forced to withdraw its forces to its base at Tanf near the Jordanian border after launching what appears to have been a poorly conceived offensive aimed at capturing the strategically important eastern Syrian town of Abu Kamal on the Syrian-Iraqi border. An operation aiming to capture the eastern Syrian town of Al-Bukamal, has began on June 28, adding to the pressure facing Islamic State as it faces a separate, U.S.-backed offensive in northern Syria aimed at driving it away from the Turkish border. “The clashes are inside the (town) and matters are not yet settled,” said the rebel commander of the Asala wa-al-Tanmiya Front, one of the Marin elements of the New Syria Army. The rebel forces entered the town at dawn, he said. The Syrian Observatory for Human Rights said the offensive was being mounted with backing of Western special forces and U.S.-led air strikes. A DIFFERENT THALAB PATROL VEHICLE NEAR AL-TANF BORDER CROSSING, SYRIA IN EARLY MARCH. IT IS POSSIBLE THAT THE VEHICLE IS OPERATED BY FOREIGN SPECIAL FORCES. Tthe Jordanian Thalab Long Range Patrol Vehicle has been spotted with the New Syrian Army on two separate occasions. The Thalab LRPV is used by Jordanian Special Forces and is designed for long multi-day patrols in harsh terrain. A Thalab is rather expensive compared to the cheap Toyota Hilux pick-ups supplied to the New Syrian Army by the US. It’s possible that foreign special forces are operating this vehicle, the lack of footage of the Thalab in official New Syrian Army videos further supports this theory. [January 16 2014 U.S. Special Forces to select moderate Syrian recruits for six-to-eight week training. 06/17/2014: Syrian rebels who would later join the Islamic State of Iraq and the Levant, or ISIS, were trained in 2012 by U.S. instructors working at a secret base in Jordan, according to informed Jordanian officials. 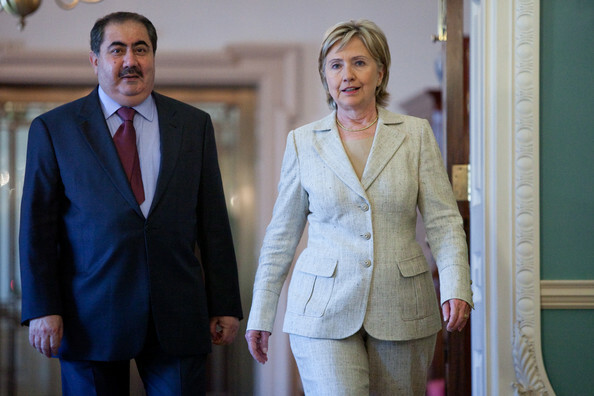 Hoshyar Zebari is the current Minister of Foreign Affairs of Iraq. A Kurd originally from Aqrah, a city in Iraqi Kurdistan, Zebari holds a masters degree in sociology from the University of Essex, England and studied political science in Jordan. This entry was posted in Uncategorized and tagged French troops at Deir Ezzor, Hoshyar Zebari, Iraqi foreign minister, is, isil, isis, joint statement, jordan u.s. training syrians, no excuse, Syria, Trump deals on Syria, U.S training syrian opposition. Bookmark the permalink.